The SJC Land Bank invites you to to meet your new Orcas Stewardship Staff and throw in a little habitat restoration to boot. 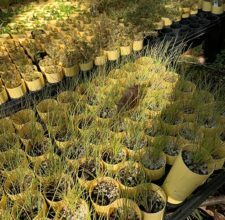 Join us in the oak restoration units to help plant plugs grown in the Salish Seeds Project nursery. We will depart promptly at 9:45 am from the South Trailhead parking area (Deer Harbor Road/Wild Rose Lane) to hike up the mountain. Tools will be provided. Dress for the weather and bring water/snacks. For more information contact Tanja Williamson at 360-378-4402 or email tanjaw@sjclandbank.org.